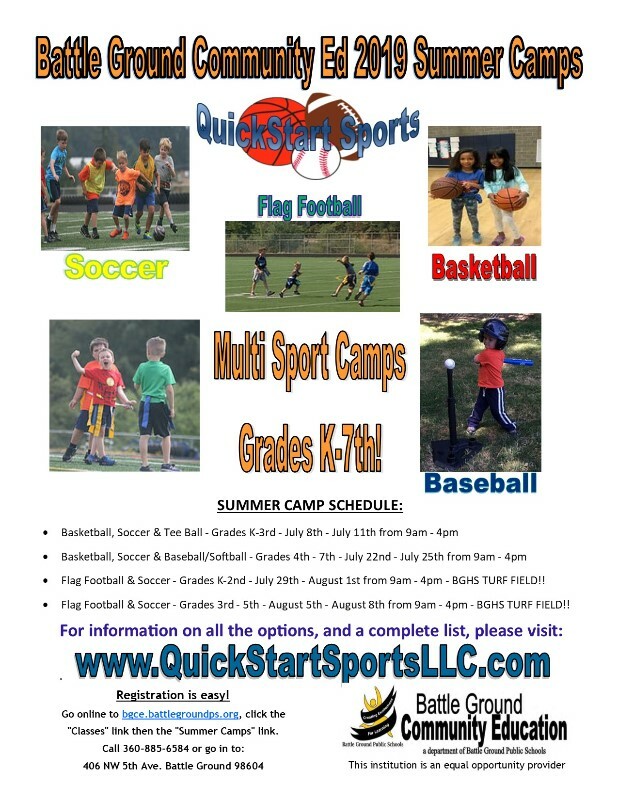 QuickStart Sports will be running a multisport 4 day camp this year for boys and girls who will be going into grades 4th-7th Camp runs from 9am-4pm, July 22nd – July 25th at Captain Strong and also at Battle Ground High School fields. This year’s camp will be a mix of sports which will include basketball, soccer and baseball/softball. This three sports camp will give you child an opportunity to play, learn, prefect, and enjoy all three sports during the four day camp while building a unique interest towards the sport that they enjoy and excel at the most. Our camps help partcipants learn and prefect new skills of the various sports, build new friendships, improve physical activity and mental stimulation, gain independence but also learn to work together as a team, build confidence in their abilities with the sport and abilities to demonstrate them in front of others, and most importantly (for the kid at least) have a ton of fun! Don’t miss out on this summer’s opportunity, ad sign up today!